I discovered Firefly after the TV series had already ended. My deep dive into the board game hobby post-2008 saw a corresponding deep dive in the number of hours I formerly spent watching movies and television. My wife and I saw the trailer for Serenity, though, and we were intrigued enough to go opening weekend. Although we did not know much about the backstory, Whedon’s script brought us up to speed quickly, and we both fell hard for the characters and the adventure of the story. I ordered the DVD set and we binge watched it in the producer’s preferred order, unlike Fox’s original asinine out-of-sequence scheduling. What is it about that band of lovable rogues that attracts so many ardent fans? I can only say from the American experience. Many of us identify with the romance of a band of underdogs fighting against the oppression of a foe with greater numbers. Star Wars. The American Revolution. The Bad News Bears. It’s the same story played out in different genres and time periods. If your game group loves playing space pirate games, well then let’s Spice Up your game night with Scorpius Freighter published by AEG. 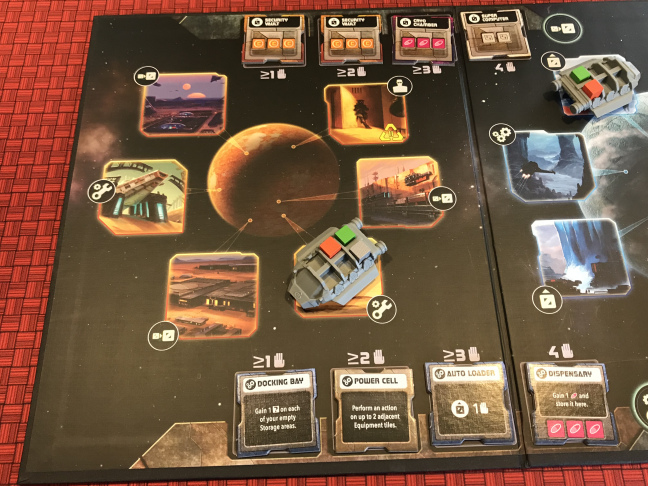 Scorpius Freighter is an interplanetary game of tile placement, smuggling and engine building designed by David Short and Matthew Dunston. It’s geared for two to four freighter pilots and plays in about 50 minutes. The elevator pitch? 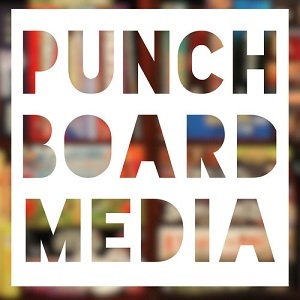 It is a pick up and deliver game in space where you never have to pick up and deliver. I don’t recall ever playing a David Short design before, but Matthew Dunston’s Elysium was one of my favorite games from 2015. (It is still a shame we have yet to see an expansion.) 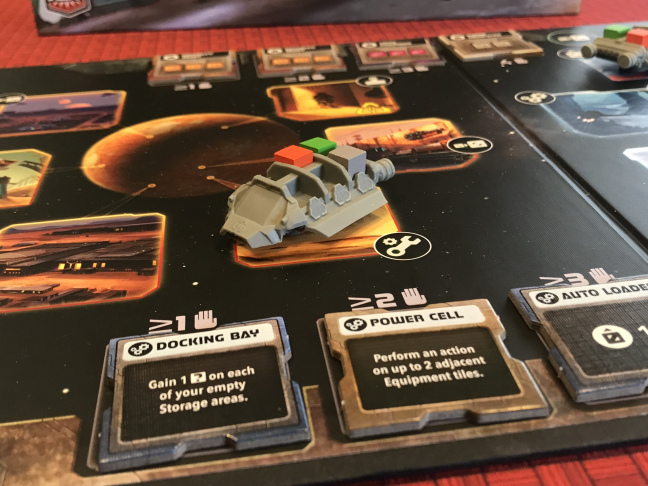 I was a little disappointed in the game play of Diesel Demolition Derby, a card based game designed by Dunston from last year, but based on my love of Elysium, I was excited about Scorpius Freighter. Plus, I like the theme a whole lot better than DDD. Please note, AEG was kind enough to provide us with a review copy of the game. For a game that has a lot of bits and components, the gameplay is surprisingly easy and intuitive. Players are each given a freighter ship, which they will upgrade with unique powers and storage capacity. Freighters are upgraded by traveling on three rondels on the main board. Each rondel revolves around a different planet, and there are three actions available on each rondel. The main focus of the game is filling up the secret compartments on your freighter board (which you can upgrade into larger storage during the game) and fulfilling contracts and side deals to deliver the contraband. I like how the deals are instant — there’s no moving pieces from place to place, just load up the storage and then cut a deal to deliver it immediately. Players score points based on the complexity of the contract, and fulfilling them usually gives an interesting bonus or boost. Pretty standard stuff? The twist is that each time you move the ship markers past a certain point on each rondel, that player is taxed — you have to give up some of your “honest goods” as tax to the government — and the game end gets a little closer. The movement on the rondel is limited each turn by the crew members you have available. Players will always have a crew of four to use, each with their own unique powers, but you are limited to movement (exhausting a crew member) to only one or two of your crew per turn. And here’s the last twist. As you upgrade your freighter boards, the upgrades come in the form of unique tiles. The placement of the tiles is important; some work better in conjunction with others but only if they are placed next to each other. So, careful planning of what you upgrade AND where you place it is a key to winning the game. Scorpius Freighter is one of the best presented games I’ve played in 2018. The rulebook is easy to use, and well organized. I love the artwork, kind of a cartoony version of Firefly complete with a box cover where the crew is racing to load up the “necessary meds” quickly as they stare off in the distance at some possible police activity. But the game boards and player pieces are where the game really lights up. The board itself is a beautiful rendition of the systems that the freighters are circling. And I adore the player boards. They come with a cheat sheet for the player turn and the iconography in the game — kudos on that — and are recessed for your crew cards, freighter upgrades, and contracts / side deals. The contraband is just basic colored cubes, but that’s all they need to be for this game. The box even has a great plastic insert that fits everything nice and neat, and some lagniappe! There are three cool little plastic ships that perfectly hold the cubes that are used as the rondel markers. It never gets old watching someone else agonize over which cube to fit on one of the government ships, and the ships look so cool on the table as they fill up with contraband. All in all, this is a first class production, with an included plastic organizer in the box that makes sense, holds all the pieces, and even has icons in the wells of the organizer to show you where everything goes. Minor quibbles? I have a couple. The rule book, while well laid out and with cool artwork, has a few vagaries in there. They mostly deal with the timing and wording of the unique powers of the crew cards and tiles. In every game, because of the wealth and breadth of the tiles and powers, there’s always a question that comes up that we cannot find in the book, but it was always minor things. Also, this is probably a dumb complaint, but the crew cards are a little fiddly under the board because they fit just a little too loose. I’m not sure if it is a design flaw or operator malfunction (my buddies will say the latter), and in all honesty, this is a really picayune complaint. In truth, everything about this production is top notch. This was going to be a tough review, I thought to myself, when AEG sent us a copy of the game for this review. Why should it be tough, when the theme fits right up my alley, and it has two mechanisms I love: engine building and tile laying? The hesitation was because I’m not a big pick up and deliver fan. I will admit that I have had fun the few times that I have played them, but it is certainly not the genre of games that get my juices flowing. In fact, the pick up and deliver parts of Black Fleet and Wasteland Express Delivery Service are my least favorite part, and although I like the travel size of the box, I found Mint Delivery pretty boring. What a cool surprise to learn that there is actually not a true pick and deliver element in Scorpius Freighter, even though the game is all about picking up goods and delivering on contracts. Instead, the focus is on tile placement, engine building, efficient turns, and upgrading your crew. (Plus, in the advanced mode, you can play a variant that allows you to draft your own crew in a 7 Wonders style pick-and-pass mechanic.) If that’s the reason you are interested in Scorpius Freighter, be forewarned. I still remember when I first heard of the game. It was on one of Tom Vasel’s videos. He was talking about the games for 2018 that he was anticipating the most or a Gen Con preview or some such. My buddy Phillip and I had brought back Elysium from Gen Con 2016 and played the heck out of it, so I was pretty familiar with Matthew Dunston’s design sensibilities. I put it on my “anticipated games” list, but let’s face it, the anticipation for a game is sometimes better than the execution of playing it. Not in this case. If you are like me, and you like “one hour wonder” games that deliver a big game experience in about an hour, you should consider trying Scorpius Freighter. The first play was probably the longest, clocking in a little over an hour, but since then, at every player count, we have breezily played the game in about an hour. I’ve yet to feel that there has been any big waiting period between turns, and I believe it is because on each turn, there are really only six actions you can take. Many will be eliminated without much thought, so it generally comes down to choosing between two or three actions. This week at our Sunday game night, I talked Ben into playing a two player game with drafting. It was his first game, but he is a quick study on drafting games (7 Wonders being one of his favorite games.) After a quick rules tutorial, we were off and running. Jeremy was right, drafting your crew is the way to go. The choice between keeping cards with lower costs associated with upgrading the crew member VERSUS the special powers they bring once you upgrade them from amateur to experienced is a delicious decision that gets each player excited about the strategy that could be used during the game. I’ll bet this will add a lot more repeatability to the game, too, in addition to the randomized tiles that come out every game. I have not played with the backside of the freighter board or the non-standard starter cockpit tiles, but it is on my list to accomplish at the upcoming Southern Board Game Fest on March 30. If I have one complaint about the game, and unfortunately it is a pretty serious charge in my book, it is the theme. Oh sure, the rule book pumps up the volume with lots of beautiful art of the crew that adds flavor to the game. The editor of the rules added lots of flavor text in the rules to boot. And I’ll admit, the art on the player boards and cards and main board all fit the theme. The game art certainfully fills sci-fi-ish, but what it is missing is the game play. Where is the tension that all good space pirate / rogue adventures should have? If you are coming to this game looking for an experience where you and your friends are constantly being chased by the government, where bounty hunters are periodically breathing down your neck the entire time you are trying to make a delivery — well, this is probably not the game for you. The planet rondels can only do so much to simulate tension. Sure, they create frustrating scenarios almost every turn because there is never enough skill to do everything you want to do. But, taxing a player one cube, while annoying and so many times tactics-changing, is not enough to really simulate Han Solo hiding stowaways under the walkways of the Millennium Falcon. If smooth mechanics, gorgeous artwork, and the veneer of a juicy sci-fi theme are enough for you, then by all means, start misbehavin’! Because my favorite part of Scorpius Freighter may be the comboliciouness of the game. In the late stages of the game, the combination of your crew and upgraded tiles (and even the one time bonus from your completed contracts) can all result in some juicy combos. Identifying them on the board, or being just lucky enough to flip the right tile right before your turn, is a lot of fun especially when you get them going. The limits on the skill you can use to activate the tiles I think was a good way for the designers to ratchet down any overpowered combinations, but there is still enough room to churn out some good ones by the end. I’m not a good enough player for it to happen every game, but there have been a few times since I started playing that I was able to spot an interesting combo and make it happen. Scorpius Freighter joins that list. I finally found a pick up and deliver game that I would suggest playing, instead of just agreeing to play someone else’s “favorite” game. I wish there could have been a little more rogue-ish danger added to the game, to bring out more of the theme. 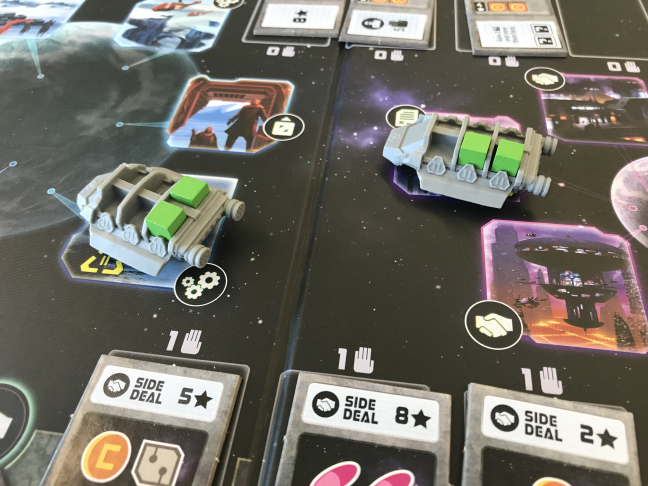 But the art and production quality, quick pace of play, unique twists on tile placement and rondels, and awesome potential for combinations all make Scorpius Freighter one of my favorite games from 2018.